Azaleas put on beautiful displays of flowers in early spring. As members of the heath family, azaleas fall into the same category as rhododendrons. However, the term azalea refers to plants with smaller, thinner leaves compared to the larger, leathery foliage of rhododendrons. Some azaleas remain evergreen while the rest lose their leaves each fall, making them deciduous plants. Azalea blooms come in an assortment of colors featuring single, semi-double or double bloom forms, providing plenty of choices for your garden. Bright red, orange or yellow flowers cover the flame azalea. Each bloom features a yellow to orange blotch on the upper lobe. This plant is native to the Appalachian Mountains and features flowers that grow larger than other azalea varieties. The deciduous shrub grows up to 12 feet in height and width. In the fall, the plant turns subdued shades of yellow and red. Flame azalea thrives in USDA Hardiness Zones 5 to 7 in slightly acidic, moist, well-drained soil. It enjoys partial shade. 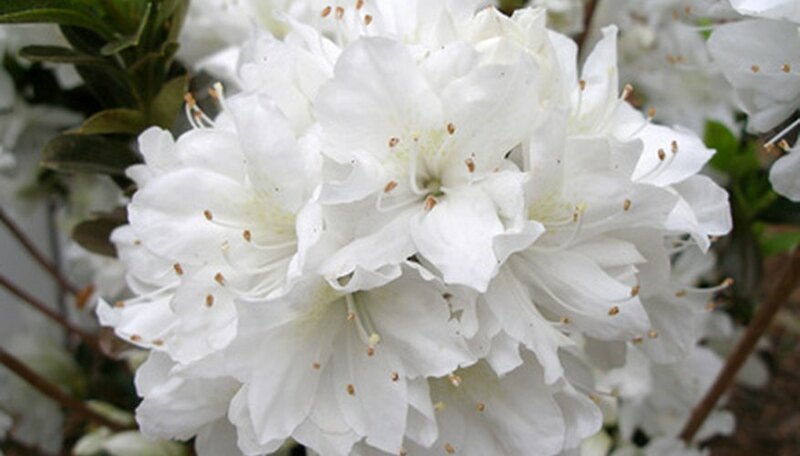 The Alabama azalea sports bright white tubular flowers on a bush that reaches up to 6 feet in height. The deciduous plant blooms in April with clusters featuring six to 10 highly fragrant blooms that sometimes appear before the plant’s leaves appear. Alabama azalea grows as a native bush from South Carolina to Alabama. The plant thrives in Zones 5 to 7 in dry, open woods or in rich organic soil on wooded slopes. It prefers full shade and well-drained, acidic soil. Also known as clammy azalea, the swamp azalea only reaches 5 feet in height, but grows up to 12 feet in width along bogs and wetlands. The native plant features a sticky corolla that helps explain its name. The plant produces beautiful, sweet-scented, white flowers with a lavender color at the base. One of the last azaleas to bloom in the spring, the flowers appear before the plant’s leaves pop out. In the fall, the foliage turns orange to maroon in color. Swamp azalea grows in Zones 4 to 9, preferring acidic, wet soil in partial shade. The plant tolerates flooding, making it ideal for gardens and landscapes with periodic standing water. Plum leaf azaleas grow up to 20 feet in height, featuring clusters of orangish-red or apricot flowers with red blotches that appear in July or August. It grows along sandy ravines near stream banks in a small area in southeast Alabama through southwest Georgia. Plum leaf azalea thrives in Zones 6 to 9, preferring acidic, moist soil in partially shady locations.